For the purposes of this post, the upper section is defined as the area and buildings starting on the northern side of Penn Street, NE at 6th Street, going west to New York Avenue, turning right, and then running up New York Avenue for one block. You can view our interactive map here (note: this is not perfectly drawn to scale and does not perfectly reflect lot lines, etc). The properties are colored by owner; the color purple indicates that the property is not owned by one of the large development companies. 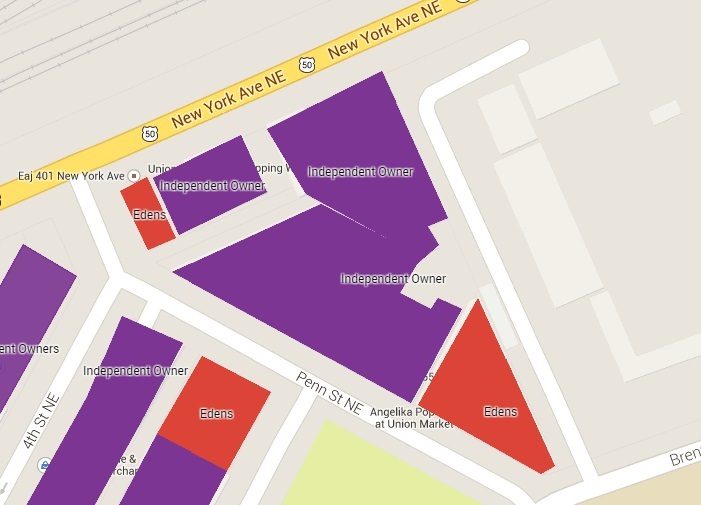 The upper section of Union Market has two large parcels that are owned by Edens but disconnected from each other. The first Edens property on Penn Street by 6th Street (550 Penn Street) is already being used by Edens as part of Union Market. In this space, Dolcezza Gelato has a factory and retail store; Angelika Film Center has a pop-up movie theater (until it moves to its permanent home in the Union Market building in several years). The second Edens owned property is down the block on the corner of New York Avenue. This building is not currently used for a public purpose by Edens, although it does have several advertisements for Union Market attractions painted onto the side of it. In between these two properties is Maurice Electrical Supply. Next to the Edens owned property on New York Avenue is an independently owned property. The large parcel next to that building is currently undergoing a major construction project. The property was previously a very rundown Quality Inn (check out some of the horrible reviews here) but was knocked down recently and is now being rebuilt as two hotels: a Hampton Inn and a Homewood Suites. In our next two Union Market series posts, we will examine two existing parts of the Union Market area that you may be overlooking but are well worth you checking out. Special thanks to Washington Business Journal for their previous reporting on the real estate deals in Union Market and to ANC 6C 06 Commissioner Tony Goodman for his help in answering questions about the area.